Nova is the product of a very special collaboration between RW QGC Jewelspride Solo and DGC Bengal Flats Sheridan of Fraser Valley. 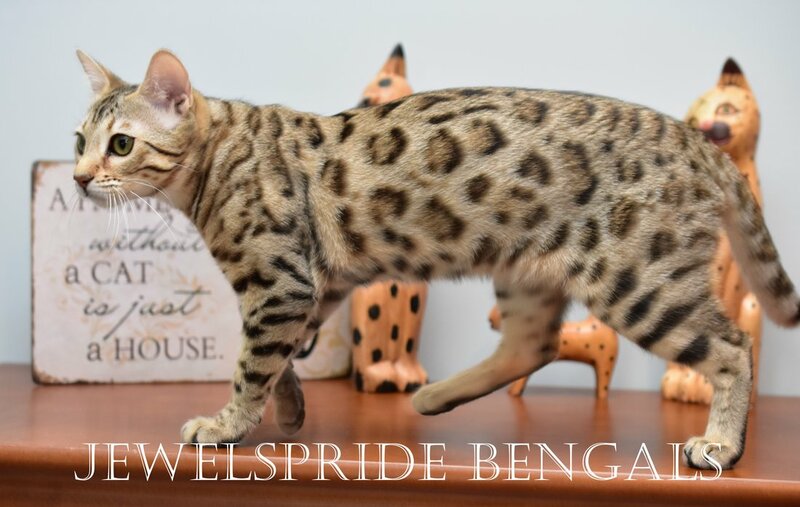 Thanks so much to Sheridan's owner, Kelly Hayton of Fraser Valley Bengals, for allowing us pick of the litter in exchange for the breeding with our boy Solo. Nova brings some wonderful things to our program... in particular we're hoping to pass along some of her grandmother Dia's super wild looking genetics and wonderful personality. We have been trying for quite a while to produce a girl from this line with some of her grandmother's wonderful genetics, but to date have been blessed only with boys (Solo, Uno, and Dia's newest little snow boy). Here's hoping Nova brings us some wonderful kittens next year!